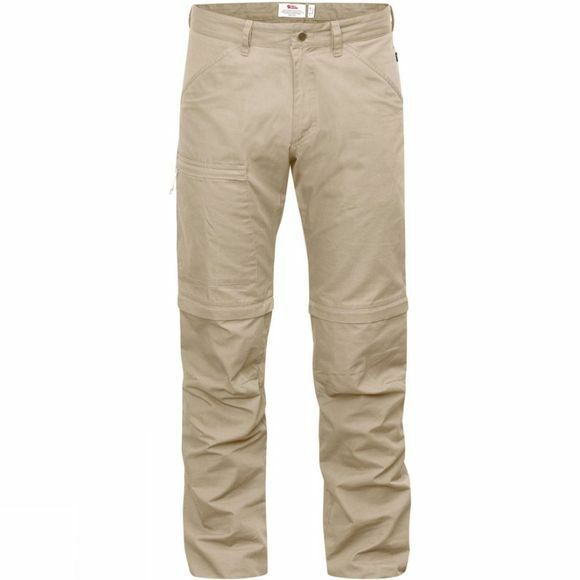 Lightweight, well-ventilated and versatile zip-off trousers for many types of outdoor life in the summer, particularly suitable for warm conditions and trekking where low weight is a priority. Zips just above the knees transform the trousers into a pair of shorts – practical when travelling and when you want to keep your packing to a minimum. Made from durable, wind resistant G-1000 Lite that dries fast and effectively releases moisture that builds up when activity levels increase. The design is simple and has only the most essential details, all to keep weight down. There are two hand pockets, a leg pocket with a zip and a back pocket, also with a zip. Double belt loops at the back keep your belt in place. The comfortable cut has pre-shaped knees and lower legs that slightly taper.